Azzi, Stephen. "Federal Government". The Canadian Encyclopedia, 13 December 2017, Historica Canada. https://www.thecanadianencyclopedia.ca/en/article/federal-government. Accessed 19 April 2019. The federal government is the national government of Canada, centred in Ottawa. The term can refer narrowly to the Canadian Cabinet, or more broadly to the Cabinet and the public service. The federal government is the national government of Canada, centred in Ottawa. The term can refer narrowly to the Canadian Cabinet, or more broadly to the Cabinet and the public service. The federal government plays a huge role in Canadians' lives — from the collection of taxes to the delivery of social services, and from the supervision of international trade to the safeguarding of national security. The provinces were given responsibility for primarily private or local matters, such as hospitals, schools, charities, municipalities, shops, taverns, transportation within a province, onshore natural resources, and property and civil rights. Everything else was placed in the hands of the federal government, which was charged with maintaining “the Peace, Order, and good Government of Canada.” The federal government was also given the power to disallow provincial laws. Over time, the balance shifted, largely because of a series of court rulings. Britain’s Judicial Committee of the Privy Council, which functioned as Canada’s highest court for constitutional cases until 1949, limited the federal government’s area of jurisdiction. The court paid less attention to Ottawa’s responsibility for peace, order, and good government than to the provincial jurisdiction over property and civil rights. 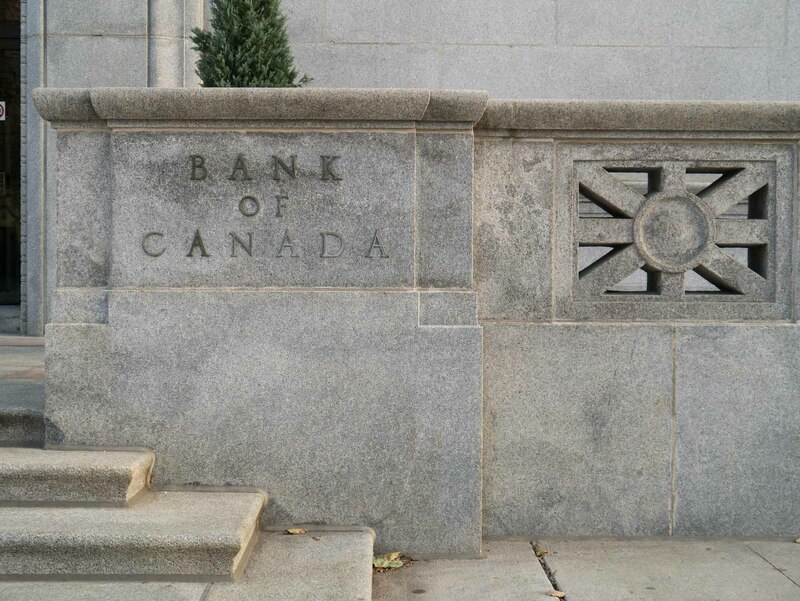 The court ruled that the federal Parliament could not pass laws on unemployment insurance, competition, trade and commerce (except across provincial or national borders), or minimum wages and maximum work hours (except in federally-regulated industries, such as banking). The peace, order, and good government clause applied only to national emergencies, in the view of the court. Also important in shifting the balance was the growing importance of matters like health care, a provincial responsibility. The federal government is responsible for implementing the legislation of the Canadian Parliament. The British North America Act gives Parliament responsibility over national defence, money, banking, bankruptcy, Aboriginal affairs, citizenship, marriage and divorce, shipping, railways, fisheries, interprovincial and international trade, the post office, criminal law, penitentiaries (which house prisoners serving sentences of two years or more), the census and statistics, weights and measures, patents, and copyrights. A constitutional amendment in 1940 gave the federal government power over employment insurance. Court rulings later recognized that federal jurisdiction includes several trans-provincial matters that had not existed at the time of Confederation: radio and television broadcasting, aviation, pipelines, and telecommunications. In several areas, there is overlap between the two levels of government. The water in a lake is within provincial jurisdiction, but the fish and the boats are federal. The federal government defines marriage, but the provinces decide how it will be formalized. Either level of government can legislate in the area of agriculture and of immigration, though if the laws conflict, the federal statute takes precedence. The federal government conducts Canadian foreign policy and implements treaties, but provincial legislation is necessary to comply with treaties that deal primarily with areas in provincial jurisdiction, according to a controversial 1937 ruling of the Judicial Committee of the Privy Council. In addition, the federal government can use its spending power to enter the provincial realm. For instance, the federal government was able to create a national medical care program by sharing costs with any province that agreed to establish a health care plan that met certain standards. The head of the federal government is the prime minister, who is the government’s main spokesperson, chief policymaker, and chair of Cabinet. On the advice of the prime minister, the governor general (acting on behalf of the Crown) summons, prorogues, and dissolves Parliament; calls elections; and appoints Cabinet ministers, senators, ambassadors, deputy ministers, provincial lieutenants governor and the speaker of the Senate. The governor general, acting on the prime minister's advice, also appoints judges of the federal courts and the superior, district, and county courts of the provinces. Except in the rarest of occasions, governors general follow the recommendations of the prime minister in discharging these duties. 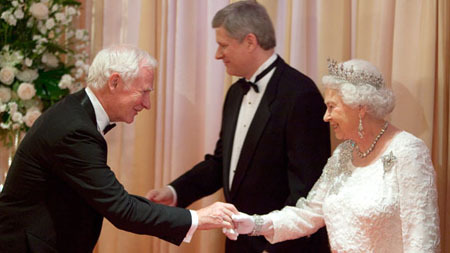 David Johnston meets Queen Elizabeth II and Prime Minister Stephen Harper prior to his investiture as Governor General of Canada in 2010 (courtesy of the Prime Minister's Office). The government is inseparable from the prime minister and his political party, and is often informally named after the prime minister (e.g., “the Harper government” or “the Trudeau government”). If the prime minister resigns or dies a new government is formed under a new prime minister. Canadian prime ministers have only left office through death or resignation (including resignation following defeat in a general election). When there is a vacancy, the governor general calls on someone who can form a government that would command the support of the House of Commons. In practice, this is always the leader of the party with the most seats in the Commons. On rare occasions, the prime minister may be the leader of a party that does not have the most seats. In the election of 1925, the Liberals were reduced to second place in the Commons, but Prime Minister William Lyon Mackenzie King stayed in office with the support of the Progressives, the third party. If the government loses a major vote (known as a confidence vote) in the Commons, the prime minister has two options: to ask the governor general to call an election or to resign. Continued deadlock between the government and Parliament is impossible under the Constitution. After an election, the government may either stay in office — if it can command the support of a majority of members of Parliament — or resign. Since 1980, Cabinet has been composed of between 20 and 40 ministers. Most ministers are members of the House of Commons, though there is often one senator (who serves as the leader of the government in the Senate), and sometimes two or three more senators. Occasionally non-parliamentarians are appointed to Cabinet, but they quickly seek a seat in the House of Commons or are appointed to the Senate. Most ministers are responsible for overseeing a government department. Prime ministers may also appoint junior ministers or "ministers of state," who often do not lead government departments, but who assist a Cabinet minister with specific responsibilities. Appointing a Cabinet is a complicated business. Prime ministers try to seek representation from all the provinces, as well as a good number of francophones, women, and ethnic minorities. Votes are rare in Cabinet. Instead, the prime minister listens to the discussion and then determines the Cabinet decision based on a consensus of ministers. The collective responsibility of the Cabinet means that all ministers publicly support all government policy. Ministers do not have the luxury of taking independent positions on policy matters. Ministers are also individually accountable to Parliament for the actions of their departments. 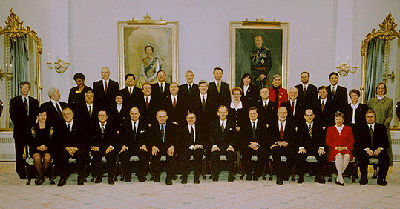 Photo of the Cabinet of the Liberal government of Prime Minister Jean Chretien, 1996 (photo by Sergeant Michel Roy/Office of the Governor General). The government’s business is too extensive to be handled by the Cabinet as a whole. Since the Second World War, and increasingly since Prime Minister Pierre Trudeau’s Cabinet reforms, most Cabinet work has been done in committees. Prime Ministers determine the number and function of these committees. All governments now have Cabinet committees responsible for broad policy areas (such as social, economic, and foreign/defence policy). Most recent prime ministers have chaired a committee that takes care of the government’s strategic direction and long-term priorities. Also common is a committee to handle the day-to-day government agenda. The Treasury Board has responsibility for the financial management of the government, accountability, ethics, and personnel. The permanent public service assists in the administration of the government, implements policy, delivers programs, and provides advice to the Cabinet. Public servants are non-partisan and serve the government, regardless of which party is in power. The government is divided mainly into departments, agencies, and crown corporations. (In addition to these large organizations, there are also smaller government units including departmental corporations, agents of Parliament, shared governance corporations and joint enterprises.) Each mainline department is headed by a minister. In a small number of cases, a department may have two or more ministers (e.g., the Department of Global Affairs has three ministers). Ministers are advised by the public servants in their department, the most senior of whom is the deputy minister, and by a small number of political staff in the minister’s office. Federal government agencies include the Canadian Radio-television and Telecommunications Commission (CRTC) and the Canadian Transportation Agency. They perform regulatory and administrative functions. Crown Corporations are owned by the government and deliver services at arm’s length from the government. 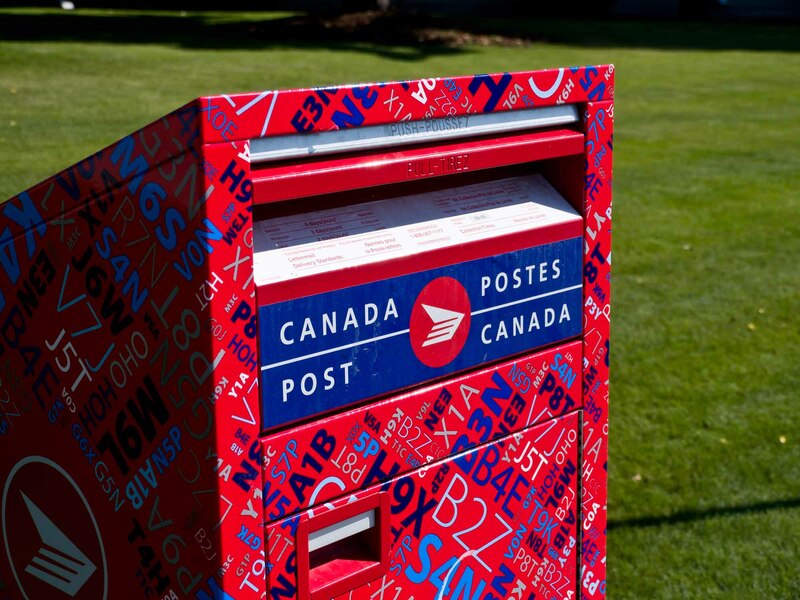 They include Canada Post, the Canadian Broadcasting Corporation (CBC), the Bank of Canada, and the Royal Canadian Mint. The most important federal government institutions are the central agencies (often informally called The Centre). These are the Cabinet, the Privy Council Office, the Treasury Board Secretariat, and the Department of Finance. The Privy Council Office is the prime minister’s government department. It is staffed by public servants and led by the clerk of the Privy Council, who is also secretary to the Cabinet and de facto head of the public service. The Privy Council Office (PCO) co-ordinates the activities of the government and oversees the appointment of senior officials in departments, agencies, and crown corporations. It provides non-partisan advice and administrative support to the prime minister and the Cabinet. The Treasury Board Secretariat is a department that puts into effect decisions of the Treasury Board, a Cabinet committee that functions as the management board for the administration of the federal government. The board is chaired by the president of the Treasury Board, a Cabinet minister. The board oversees public service personnel, labour relations, and the expenditure of funds by government departments and agencies. The Department of Finance prepares the federal budget, which must be approved by Parliament. The budget establishes the government’s financial direction and announces revenue and spending projections, tax rates, and various government policy proposals. 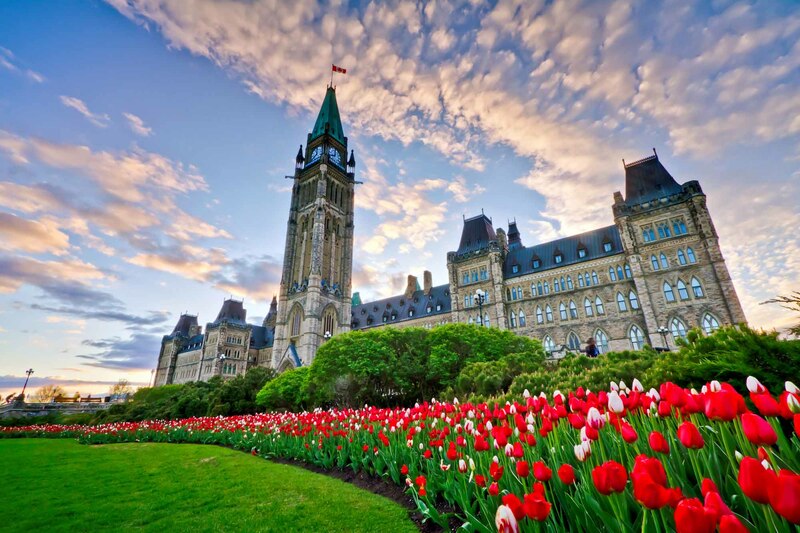 Funding for individual government departments and programs is sought from Parliament though documents called the Estimates, which are prepared by the Treasury Board Secretariat and tabled each March in the House of Commons. Other key departments are Justice; Health; Public Safety and Emergency Preparedness; National Defence; Global Affairs; and Innovation, Science and Economic Development. Also central to the functioning of the government is the Prime Minister’s Office (PMO), composed of partisan appointees who advise the prime minister on the political aspects of his job. Under the direction of the prime minister’s chief of staff, and in close co-ordination with the PCO, the PMO provides political advice and support on policy, media relations, speeches, correspondence, scheduling, and the prime minister’s travel. English and French are the official languages of the federal government. The federal government’s revenues come primarily from taxes. Personal income taxes account for almost half of federal revenues, corporate taxes provide another 15 per cent, and the Goods and Services Tax (GST) supplies 11 per cent. Miscellaneous taxes (such as customs duties and taxes on gasoline, cigarettes, and alcohol) account for just 8 per cent. The remainder of federal revenues come from Employment Insurance premiums, the profits of crown corporations, and the sale of goods and services. Roughly 20 per cent of federal spending is in the form of transfers to other levels of government to help fund higher education, health care, and other social programs. Transfers to provinces also include equalization payments, designed to reduce disparities in services between richer and poorer provinces.Other transfers account for about 15 per cent of federal expenditures. These include assistance for social housing, skills training, transfers to First Nations communities, as well as transfers through the tax system to corporations and individuals. About 30 per cent of federal spending pays for the operations of the federal government. The three largest departments in this operational category account for half of these costs: National Defence, Public Safety and Emergency Preparedness (which is responsible for the RCMP, penitentiaries, and border security), and the Canada Revenue Agency (the country’s tax collector). Interest payments on the national debt account for one-tenth of the federal government’s expenditures. Tensions between the federal government and provinces are as old as the country itself. One source of conflict is Ottawa’s insistence on playing a role in areas that are primarily within provincial jurisdiction. The federal government has argued that it has a responsibility to maintain national standards — that Canadians, regardless of where they live, deserve the same level of health care and other services. Yet for the provinces, the federal government is intruding in their business. They say Ottawa should not be allowed to dictate how federal money is spent in areas of provincial responsibility. Cuts in recent decades to federal transfers have heightened these tensions. For many decades, Canadians have been concerned about the concentration of power in the Prime Minister’s Office. The prerogatives of the prime minister — including the power to appoint and fire Cabinet ministers, plus hundreds of other federal government office holders — have meant that whoever occupies this position is the dominant figure in Canadian politics. When the prime minister’s party holds a majority of the seats, it is almost impossible for a government to lose a vote in the House of Commons, or face significant restrictions on the government's agenda. Critics have long argued that prime ministers are too powerful and that reforms are necessary as a check on their authority. Rand Dyck and Christopher Cochrane, Canadian Politics: Critical Approaches, 7th ed. (2014); Stephen Brooks, Canadian Democracy, 8th ed. (2015); Graham White, Cabinets and First Ministers (2005); Jennifer Smith, Federalism (2004). Parliament of CanadaThe official source for current news and information about the Parliament of Canada. Also features online webcasts, Hansard, history notes and much more. Check out the useful "How Canadians Govern Themselves" paper from the Information and Documentation Branch.